October 1st marks International Coffee Day and, while we make sure to celebrate the nectar of the gods on a daily basis, we figured that today we should highlight a few of the coffee products that we can’t stop thinking about. From high end espresso machines to on-the-go options, every man needs a way to quench his thirst for that sweet, sweet cuppa joe each morning. So we’ve rounded up some of our favorites for today (and everyday, really). We’d all love to have a professional barista at our personal disposal. Though for those of us who can’t afford such expertise service or daily brews from pristine coffee shops, the La Colombe Coffee Vault exists to meet your needs. The Coffee Vault takes the hassle and guesswork out of brewing your own professional grade cup, so you can be your own barista. 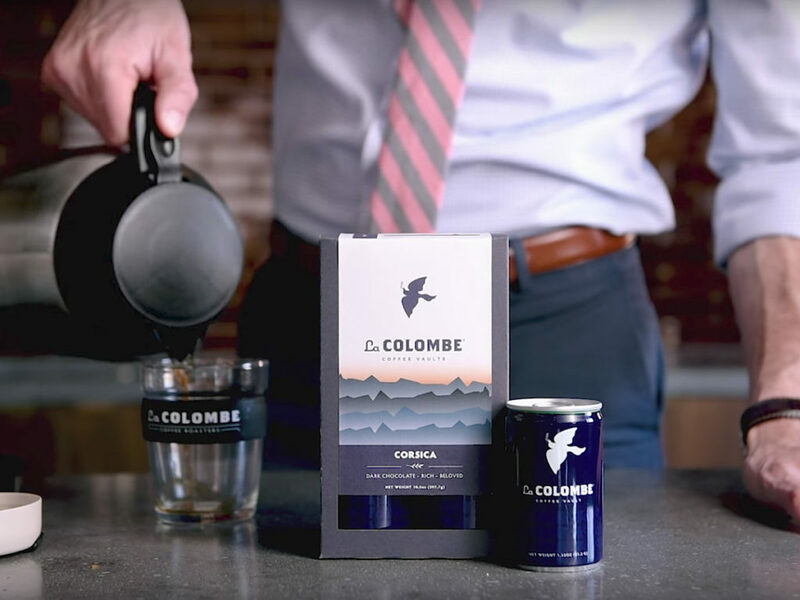 Each of the La Colombe Coffees is pre-ground, pre-measured and preserved under pressure just waiting for you to brew a perfect and fresh pot of drip coffee. After a chance meeting on a camping trip in the Canadian wilderness, the two men bonded over a need for an accessible coffee maker that can be carted along on any trek, and the Bripe Coffee Brew Pipe born. 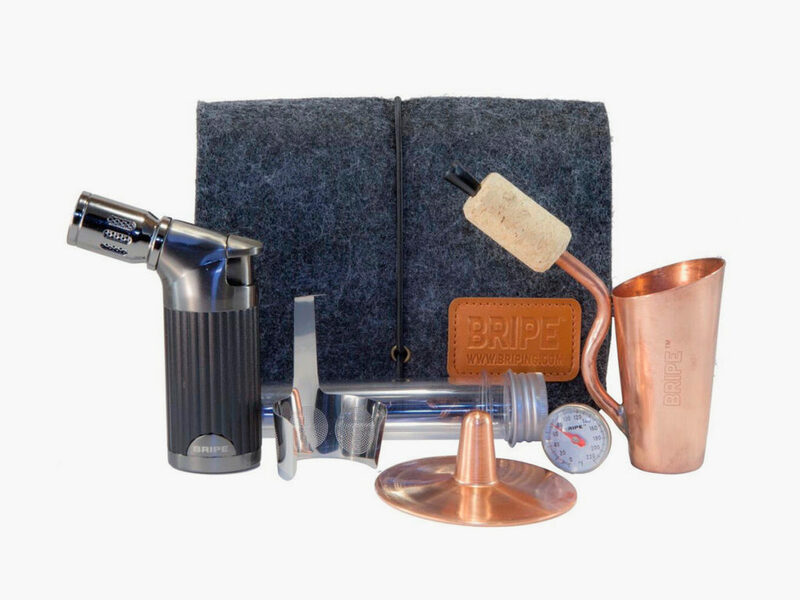 The Bripe is a small, lightweight, copper and silver pipe that brews up delicious coffee anywhere in the world. It produces the energy giving beverage without the use of electricity, a gas canister, kettle, or stove. Simply add ground coffee and water to the Bripe and then use its included portable butane-powered quad jet torch to warm your blend of choice. If you love barista quality espresso and minimalist design, stop what you’re doing and lend us your ears. You can thank us later. You're going to love the Newton Espresso, a lever-press espresso machine with an award-winning, minimalist design. Adopting a simple piston design to emulate the high water pressure needed to make espresso, there are no electronics or parts that need maintenance or cleaning. Because it’s a manual process, you have full control of the results depending on the amount of pressure you apply. With Newton, you can create customizable and consistent barista quality coffee for your home or studio. Since there are no electronics, it is completely silent; no need to worry that you’ll wake anyone up early in the morning or late at night. A simple construction made of wood and aluminum, everything is coated and anodized for durable kitchen needs. It can even be mounted on the wall to save space — while being fully functional — or lifted down in a second to suit your fancy, making it a very portable and adaptable part of your kitchen. What happens when a modern design studio and an espresso machine repair shop share the same business space in Berkeley, California? This may sound like the setup to a strange joke, but the real story behind AnZa is no laughing matter. And its new product, the AnZa Espresso Machine is far from a punch line. Set to go into production early in 2018, the AnZa is unlike any other espresso machine you’ve ever encountered. 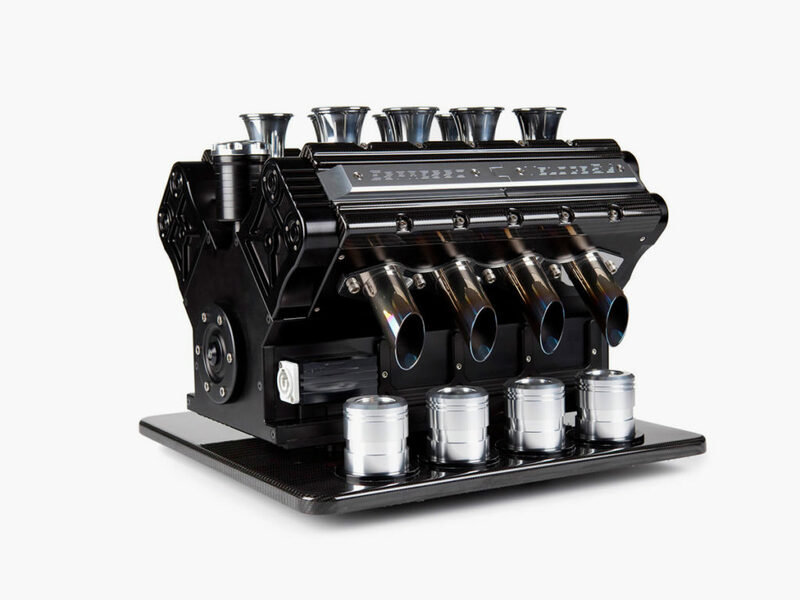 Able to serve up a cup of fine espresso as well as any other machine on the market, this exclusive product truly sets itself apart in terms of its stark and striking design. 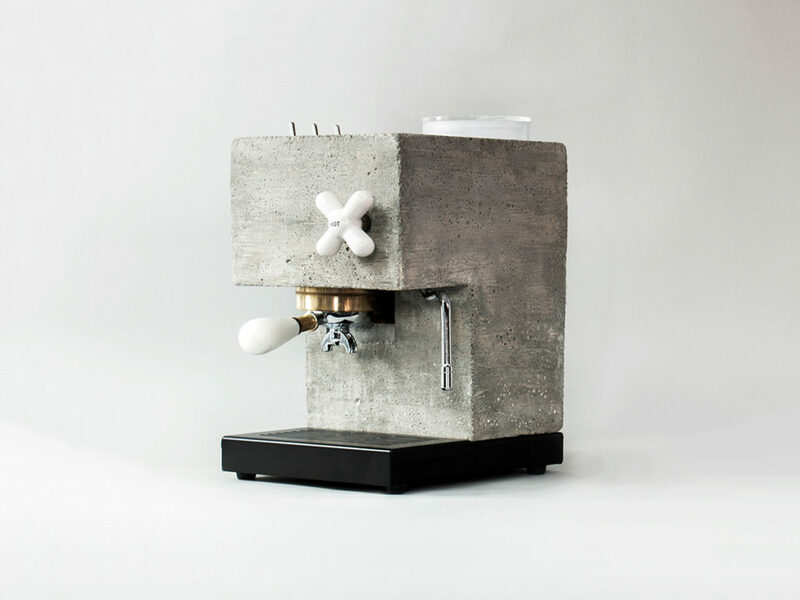 The AnZa Espresso Machine is part high-end kitchen appliance and part fine art object. It is available in both concrete and Corian models. The simple fact of the matter is that a cup of delicious, caffeine-filled espresso is only as good as the equipment you use to make it with. Sure, you could try to make a nice cup of espresso with that ratty old machine you inherited from your parents when you moved into your first apartment… but do you really want to? That thing has absolutely seen better days, but luckily your best days are still in front of you. The Espresso Veloce Nero Carbonio 380 was designed from the ground up to be the last espresso machine you’ll ever need in more ways than one. It’s a single serve, ground coffee capsule type espresso maker with Grappa Dispenser that weighs just a slender 47 lbs. With dimensions of 15″ by 16.5” by 13″, it’s the perfect size to fit in nearly any space in your kitchen. It offers an anodized satin black engine V block and anodized bright black cylinder heads that, when combined with the sophisticated jet-black high pressure thermostat carbon fibre allow it to be as attractive as it is powerful. All components are manufactured in anticorodal stainless steel and titanium, creating something powerful enough to stand the test of time to the point where you may just be handing it down to your own kids one day. For those that are passionate about coffee, the process of making your own can be an extremely pleasurable ritual. 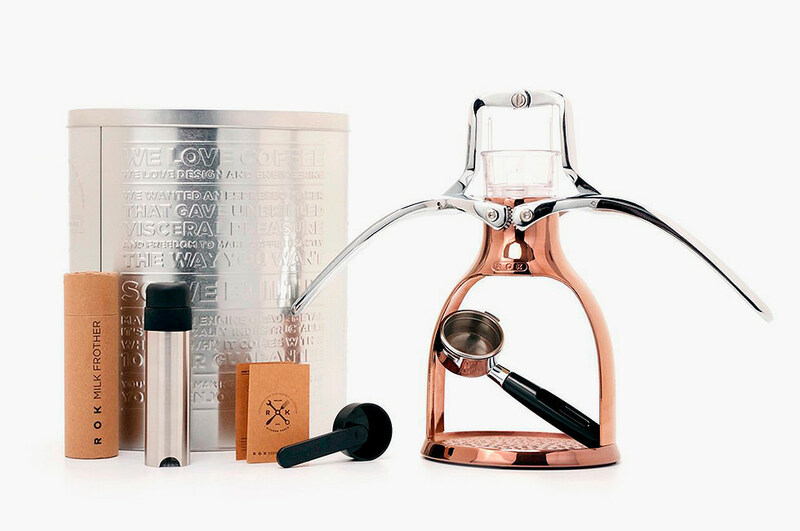 You could potentially invest in an espresso machine, but for those that want even more involvement in creating their morning joe, the ROK Espresso Maker may be just the machine to deliver a more involving hands-on experience. 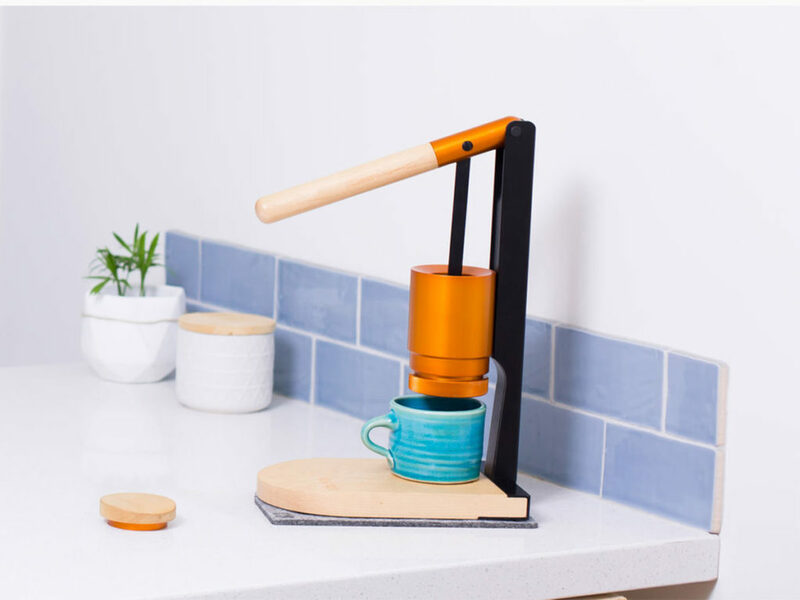 The ROK Espresso Maker is designed and engineered in London and foregoes electricity for a manual and tactile coffee making experience, designed to press the coffee from the grinds with your own hands using its winged design. With experience, this hands-on experience should enable you to fine-tune your coffee to your personal taste. It’s mechanical simplicity also allows you to hand-create any cafe-quality coffee drink you can imagine, completing your dreams of actualizing a home cafe. We all know how sour a morning can turn without a jolt of a favorite caffeine brew, or what a struggle it is to make through a budgetary meeting without a sip of the caramel colored stuff. Kuju Coffee has arrived on the scene to provide an easy, equipment-free way to always have that all important cup of coffee available. Their Pocket Pour Over system is not only a simple but also an ethical way to maintain those caffeine hits. 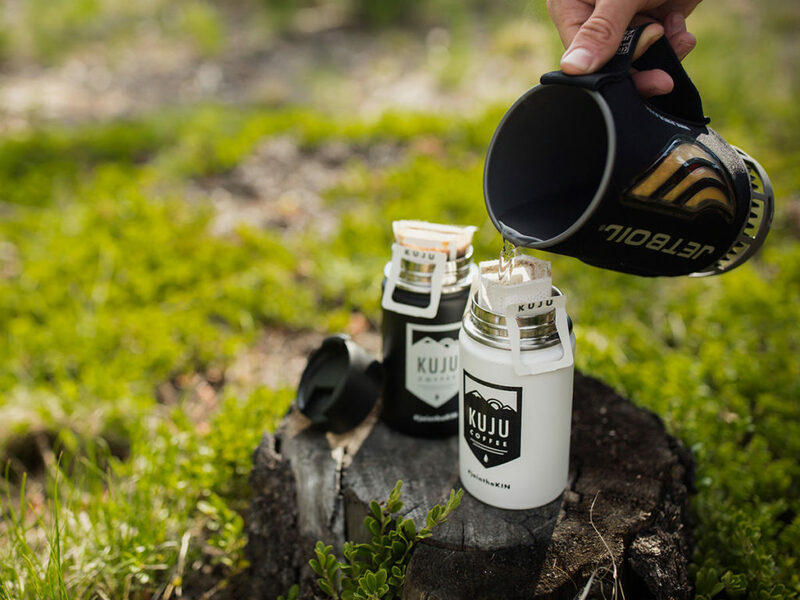 Kuju has put its 100 percent Direct Trade coffee into a pocket-sized personal brew system which allows anyone to brew delicious coffee wherever in the world they are. A plastic brewing filter clips onto the side of any size mug for a steady brew, even with a less than preferable water supply. Each mini pocket filter is filled with the brand’s small batch roasted coffee which has been preserved via Kuju’s trademarked Nitro-Flush packing technology. Thus the coffee portions can easily be stuffed away inside pockets, purses, desk drawers, backpacks, tackle boxes, or suitcases for on-the-go consumption.